Vitaly Klitschko is desperate to fight David Haye, although his brother is also keen to face the Briton. (CNN) -- The Klitschko brothers, Vitali and Wladimir, will flip a coin to see who fights Briton David Haye in an attempt to unify the world heavyweight titles. The Ukrainian Klitschkos hold three of the four recognized heavyweight titles, with WBA champion Haye, who fights John Ruiz on April 3, a constant thorn in their side. Vitali, the older of the brothers at 38, has now admitted that Haye is firmly on the radar for both fighters, although as yet they do not know who will face him. Speaking to reporters ahead of the Laureus World Sports Awards in Abu Dhabi, Vitali said: "I told my brother, 'I want to fight Haye', but he said no, he wants to fight him. "For him it is personal, but for me I want the title. My brother already has two but I have to clear it with him. I really hope he listens to his older brother. Let's hope my brother listens to me. He must always respect old people. "Always you need motivation and the motivation is to have all the titles in the family. Everyone wants to see a unification. Champion against champion. Haye has the choice, one of the brothers Klitschko. "I'll tell Haye it's easier to beat me, because I'm older and I don't have as much energy as my brother. I keep my fingers crossed that he beats Ruiz. Not because I like him, but I want his title and to shut his mouth. "Maybe we decide by coins who fights him. Let's hope my brother listens to me. He must always respect old people. 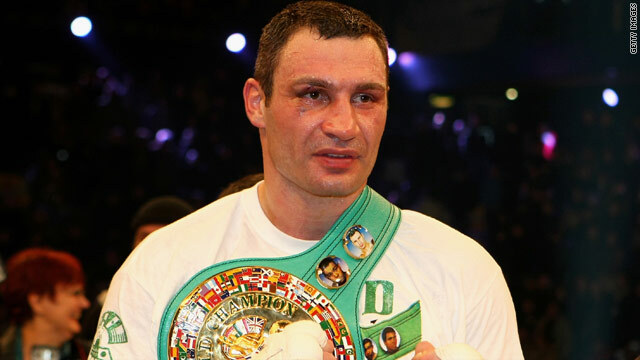 Klitschko also confirmed that he will defend his WBC title against London-based Pole Albert Sosnowski on May 29 in Gelsenkirchen. Sosnowski has stepped in to take the fight after former WBA champion Nikolai Valuev, who lost his title to Haye last year, turned down a reported $2.5M to fight Klitschko -- a decision that resulted in the Ukrainian called the giant Russian a "chicken".